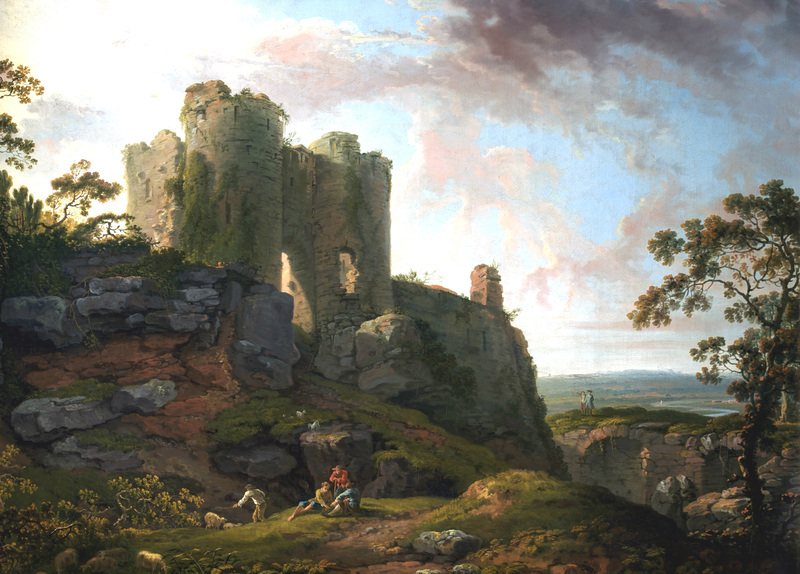 Beeston Castle stands on an isolated rock rising 225 metres above the Cheshire plain. It was begun around 1220 by Ranulf Blundeville, Earl of Chester, and passed to the Crown in 1237. This painting shows the best preserved part of the castle, the 13th century inner gatehouse with its two semicircular projecting towers, although remains of the outer bailey’s gatehouse and seven towers also survive. During the Civil War, a daring escapade by nine Royalists in 1643 led to Beeston’s capture from the Parliamentarians, but the castle fell to Parliament in 1645 and was largely destroyed the following year. Barret was a romantic and naturalistic landscape painter in oils and watercolour. He was an Irishman who came to England in 1763 and became a founder member of the Royal Academy in 1768. He was much patronised by the aristocracy, notably the Dukes of Portland and Buccleuch. In his day he was far more successful than Richard Wilson, who is now acknowledged as the classic master of British 18th century landscape: Wilson called Barret’s paintings ‘spinach and eggs’.